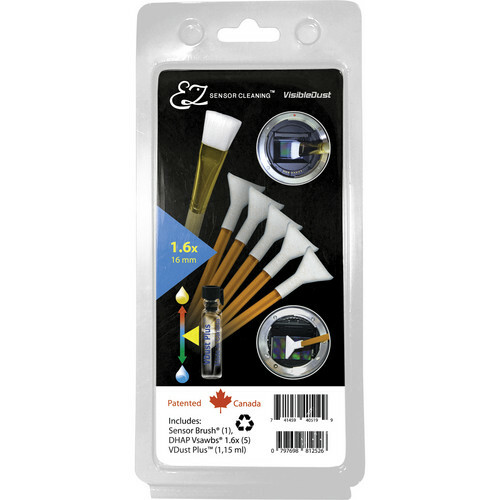 The EZ Sensor Cleaning Kit PLUS with VDust Plus, 5 Orange DHAP 1.6x Vswabs and Sensor Brush from Visible Dust contains a 1.15ml bottle of VDust Plus liquid cleaner, 5 orange 1.6x DHAP Vswabs and one sensor brush. VDust Plus liquid is a multi-ingredient, iso-alcoholic solution that goes on streak-free, removes water and oil stains and evaporates fast. The orange DHAP Vswabs V-shape design allows for ease of maneuverability within the camera chamber and corner to corner sensor cleaning. Its woven fabric design retains liquid well and prevents scratches as it cleans oil and water stains. The DHAP swab is only compatible with the VDust Plus liquid cleaner, not with other Visible Dust brand cleaners. The 1.6x DHAP orange Vswab is compatible with sensors up to 16mm. The sensor brush with its Super Charged Fibers (SCF) draws the dust away from the sensor and onto the bristles. The orange DHAP Vswabs are only compatible with VDust Plus liquid cleaner, not with other Visible Dust brand cleaners. Super Charged Fibers (SCF) draws the dust away from the sensor and onto the bristles. The VisibleDust sensor cleaning solutions and swabs are calibrated to work together to produce optimal and safe results. Please do not use alternative solutions with this swab. A simple grain of quartz which is found in cheaper solutions is enough to produce an expensive scratch on the low pass filter. These solutions are manufactured to the highest standard of quality that is practiced in pharmaceutical industries. These cleaning liquids are intended to be placed on the swab first, so the concern for liquid seeping through the sensor is not valid or accurate. On the other hand, the disadvantages of a generic brand for fast evaporative liquid used for sensor cleaning may in fact cause damage to the sensor by requiring repeat swabbing and is not recommended. Box Dimensions (LxWxH) 7.2 x 3.3 x 0.8"
EZ Sensor Cleaning Kit PLUS with VDust Plus, 5 Orange DHAP 1.6x Vswabs and Sensor Brush is rated 4.3 out of 5 by 9. Rated 4 out of 5 by tse from Sensor cleaned successfully I had to clean my sensor when it had developed spots not long after getting a sensor cleaning in the shop. I had to use the VDust Plus 5 Orange DHAP 1.6x Vswabs with liquid cleaner for two passes, using a fresh second swab for the second pass. I gave the sensor and interior a good blow out first. I'm satisfied with the performance of this product but I feel the swabs should be a little better constructed. I also feel that the manufacturer is making a ridiculous profit on this type of product. These sensor cleaning kits should sell for a small fraction of this price and a decent sized refill container of solution and swabs should be available. Rated 5 out of 5 by RealEstate_SA from Great Product I was getting several consistent spots in my landscape skies. Ran a few tests and found that I had more spots than I realized. After watching a number of videos about sensor cleaning and some additional reviews, I decided on the VDust. Take your time, watch the tutorial videos online and you can do this. A repeat of my tests and things look 99% better. Yes, you may ask why am I paying this much for little plastic swabs.....answer.....because it works. Rated 3 out of 5 by Nghi from A bit pricey for what you get This kit does everything as advertised. My aps-c sensor is squeaky clean. However, at the price point of $$you would expect it to come with extra swabs, a larger bottle of sensor cleaning solution, and maybe an a dust blower tool. Rated 4 out of 5 by Curt from An item to consider for DSLR owners I bought this item after self cleaning my sensor with a squeeze blower. That has worked OK until I saw a friend cleaned his sensor with a similar product he bought at local camera store.He shoots outdoors a lot and changes lenses frequently.I decided to buy a cleaning kit to really do a thorough job, rather than just using the squeeze blower. I recommend this product to all DSLR users. Clean sensors make better photography. I would recommend this item to those who want to keep sensors cleaner. Rated 5 out of 5 by Yong from This is it. Two thumbs up. If you need to clean a sensor? Why you waste your time and money? What happen if you need a camera while your camera is in service for cleaning? This product is definitely save your time and guarantees to clean your sensor. I bought this swap and clean mine within few minutes. Result came out perfect. It is a little bit pricey, but you get what you pay for. I will buy again and again. Rated 5 out of 5 by Art from Worked for Me...Sensor is now clean Worked for me. Photos were showing spots mostly visible in areas such as walls, sky where little data was recorded. Used the product to clean the sensor via Canon Manual and instructions inclosed. Totally clean now and easy to use. Will buy again. Rated 4 out of 5 by audiovideo1 from It works! It cleaned up my a5100n sensor really well. A couple of oil spots too. It is a bit of a pain to control the drop of the liquid cleaner. My first swap got fully soaked, but it is definitely worth. Rated 5 out of 5 by David from "First time" Great product. Easy to use. This was my first time in cleaning my sensor, and I must say did a great job in cleaning the sensor. Will buy again! Work for FULL FRAME DSLR Sensors? I haven't used this on a full-frame sensor. I used it on a APS-C sensor and they worked really well. I would guess that you could use them on a full-frame sensor but you would have to take a couple of passes to clean the entire image sensor and you may leave streaks behind. I would probably opt for a full-frame version if there is one. Will this work for a Canon 70D? Hi Adele. I've used these sensor brushes on crop sensors and full frame too, so make/model of camera doesn't matter. The wand has a lens cleaning cloth attached to it and seems exactly like PEC Pad material. Be gentle and don't forget a good quality optics cleaning fluid like Eclipse. will this work for a Nikon D7200 sensor? I have a D7100 and have used this product to clean my sensor and it worked very well. The D7100 does not have a low pass filter (and I think this is the same for the D7200). You want to use the orange instead of the green when you do not have a low pass filter. VisibleDust highly recommends for cameras without low pass filter to use orange DHAP Vswabs with Vdust Plus instead of Green MXD100.